Good evening! I've been trying to go through some of my card kits I have from swaps and use them. I color images in while hanging with my hubby in the evenings, and then when I have a few minutes I can just put the card together. This is one of those cards. I'm pretty happy with how it turned out. This is the first time I have ever tried sewing on a card. I will definitely do it again, though! I used the sketch from Papertake this week, and I also am entering this card in Crazy for Challenges (an inspiration picture). Image is colored in with Copics and the heart is accented with burgundy Stickles. I also used a Cuttlebug embossing folder. Very cute! I love that polka dot DP and embossing. Great job!! Colleen I love this and I love how it turned out with the sewing. Great card kit!!! I need to get some of mine made up also. Too cute! 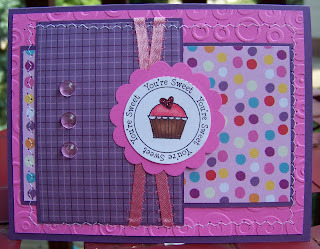 I love the cupcake and sewing on your card! YEA!!! Love your colors!!! Cute cupcake too!!! Sewing is fun huh???!!! I just need lots more practice!!! Great card...love the colors!